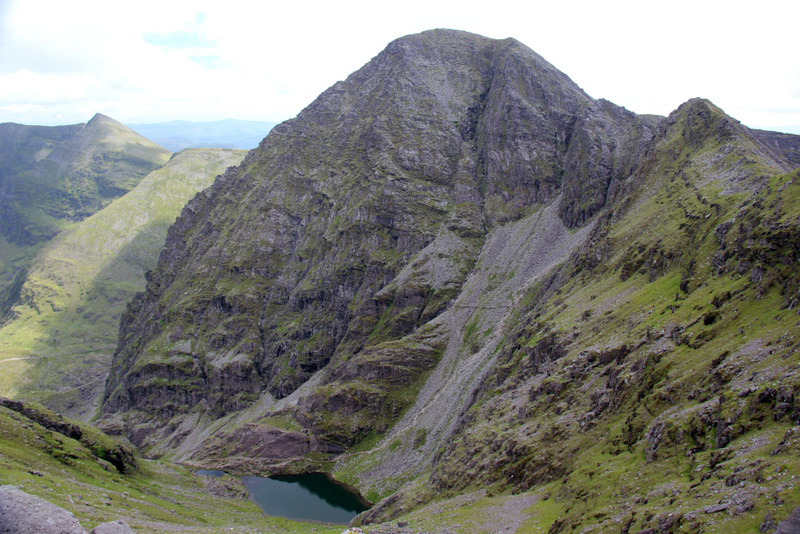 The 'Furths' is the collective name given, by the Scottish Mountaineering Club, to the thirty-four 3000ft hills lying furth of Scotland. 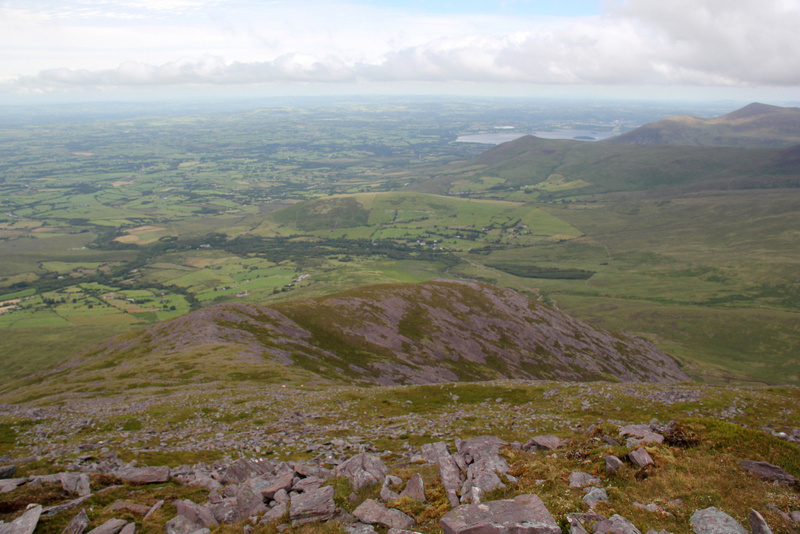 Six of these 3000ft hills are located in England, fifteen in Wales and thirteen in Ireland. 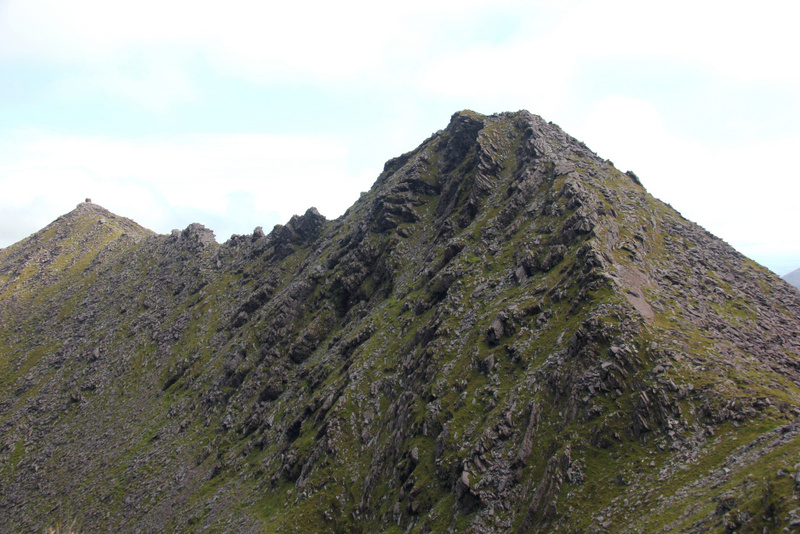 I completed the English Furths on Scafell in 2013, the Welsh Furths on Crib Goch in 2014 and had hoped to also complete the Irish Furths in 2014. 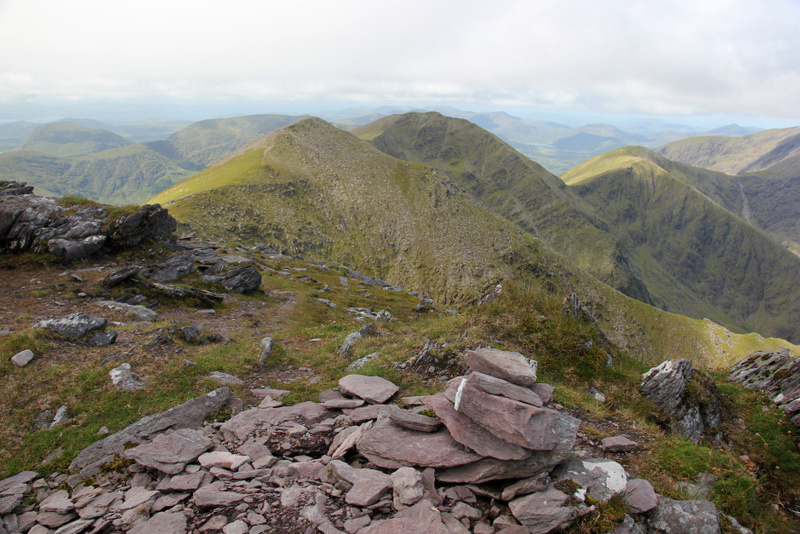 However, on my 2014 trip to Ireland, due to very bad weather, I was only able to ascend Lugnaquillia, Galtymore and Brandon Mountain leaving me still to do the MacGillicuddy Reeks; a fairly-serious circuit of hills not best undertaken in strong winds, rain and zero visibility. On Friday morning, I caught the ferry from Cairnryan to Belfast and ascended Slieve Donard, the highest peak in Northern Ireland. On Saturday, due to strong winds, poor visibility and rain, a circuit of MacGillicuddy Reeks was again out of the question. 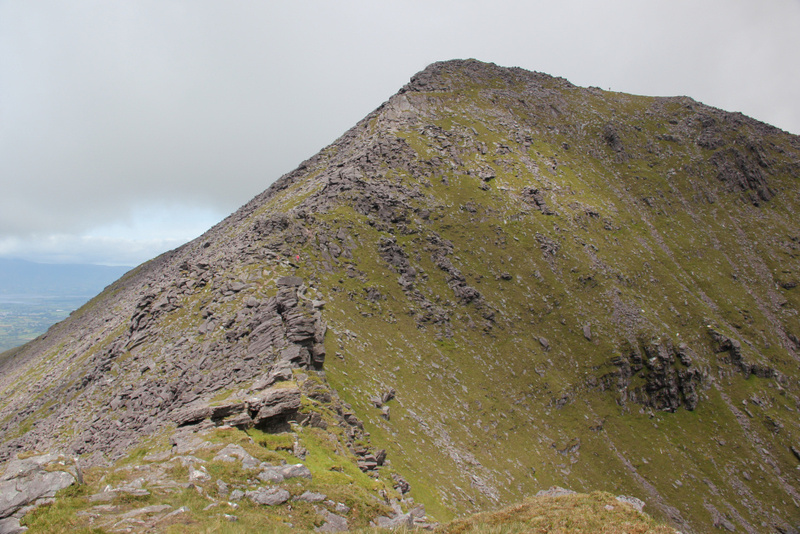 However, I did ascend Caher West Top and Caher which lie on a separate ridge usually requiring an out and back when doing the Reeks. 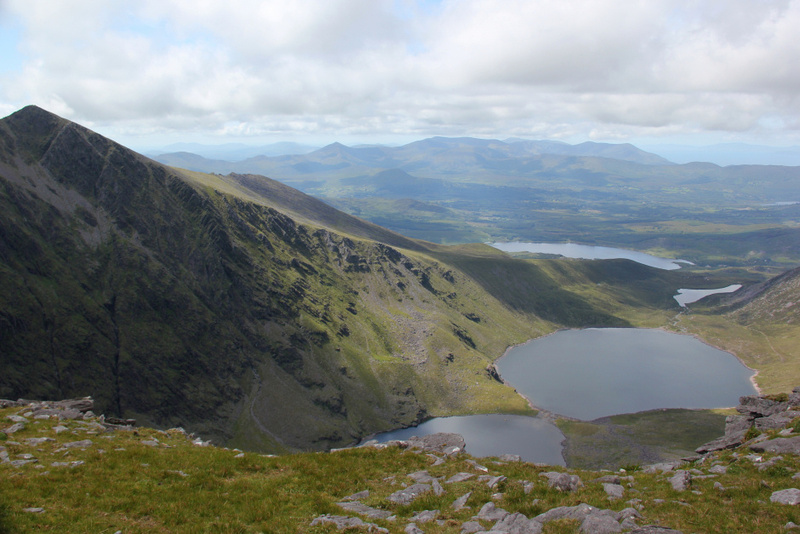 To extend the day I also went up Carrauntoohil. 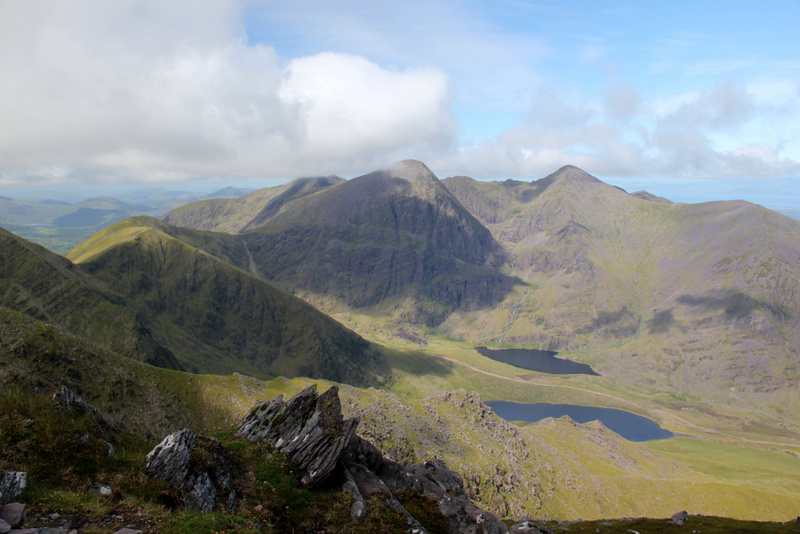 The weather yesterday was close to perfect, so a circuit of the MacGillicuddy Reeks was on. I drove to Cronin's Yard where there is ample parking (charge: 2 Euros). I set off walking at 07:30 at which time there were only two other cars in the car park. 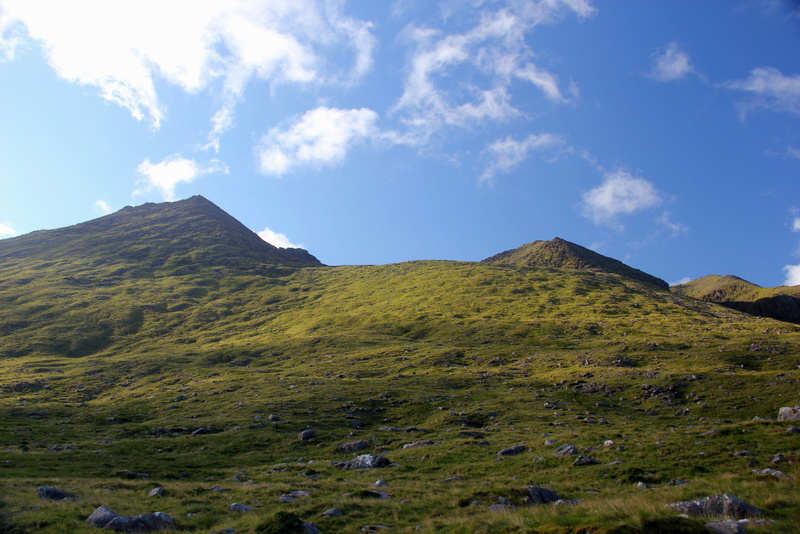 The initial walk from Cronin's Yard towards Hag's Glen was very pleasant. 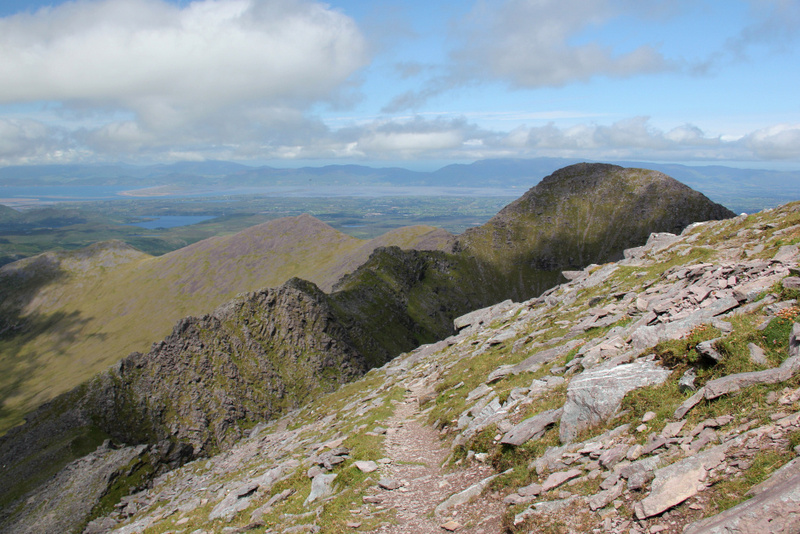 The Eastern Reeks were completely free of cloud with lots of blue sky overhead. 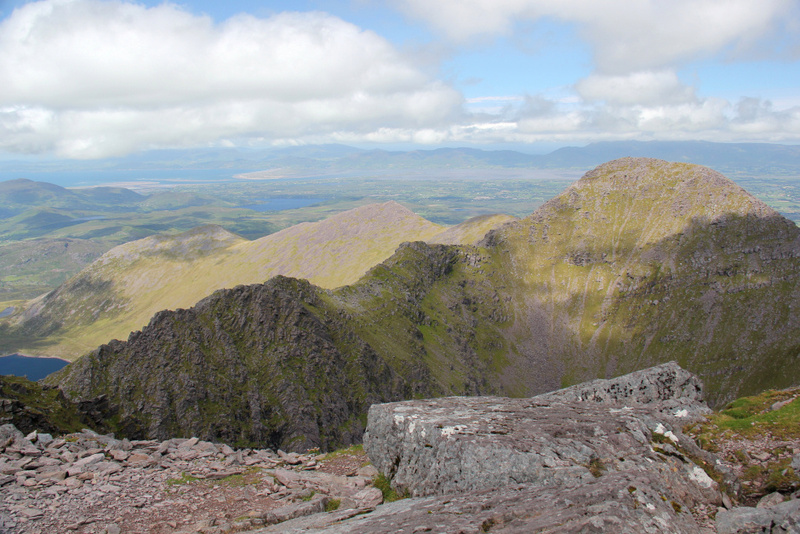 The Western Reeks had a thin covering of cloud that I suspected would burn off as the day progressed. 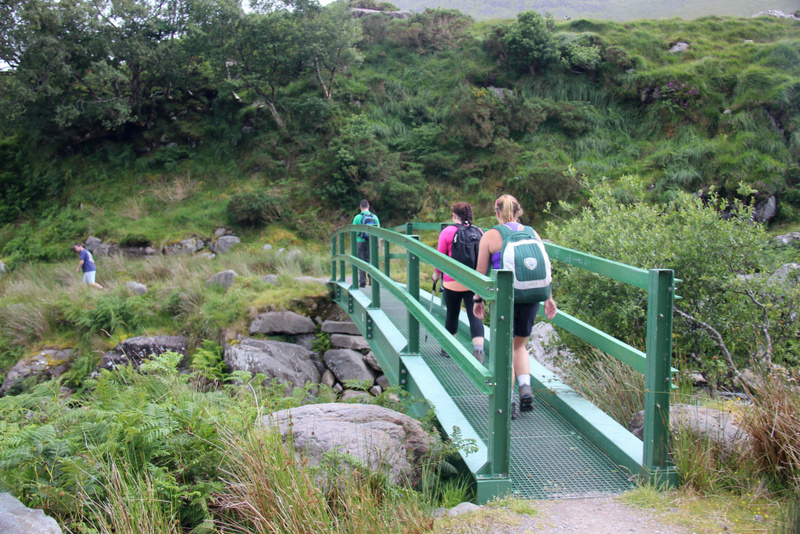 I left the Hag's Glen track and took to the hillside shortly before reaching a green bridge. The underfoot conditions were not good, probably due to the deluge of rain the night previous. I followed a faint track at first which led to a large stile over a barbed-wire fence. Beyond the stile, it was just a case of progress across trackless ground in the general direction of the hill. During the ascent of the lower slopes of Cruach Mhor, I ventured a bit too far to the South crossing over the stream running down from Lough Cummeenapeasta. I took the opportunity here to drink half a litre of water and to refill at the stream as it was already baking-hot. 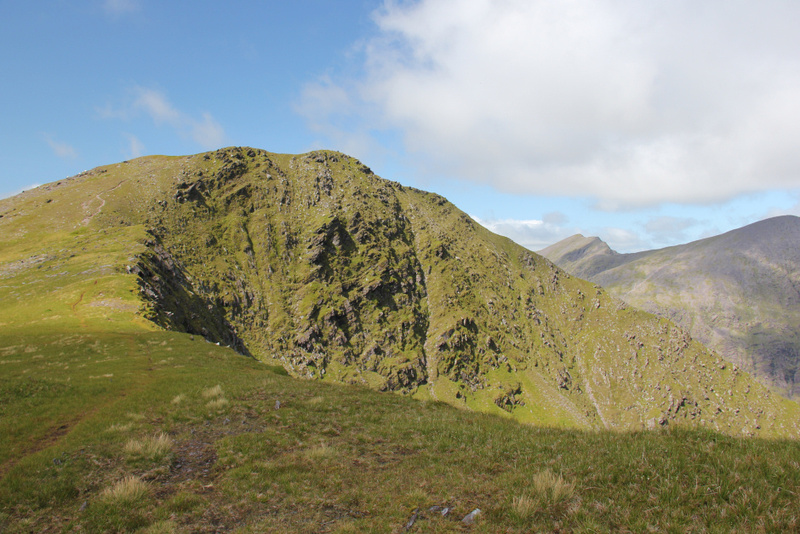 On reaching Lough Cummeenapeasta, I crossed back over to the correct side of the stream and made my way towards the East Ridge of Cruach Mhor. 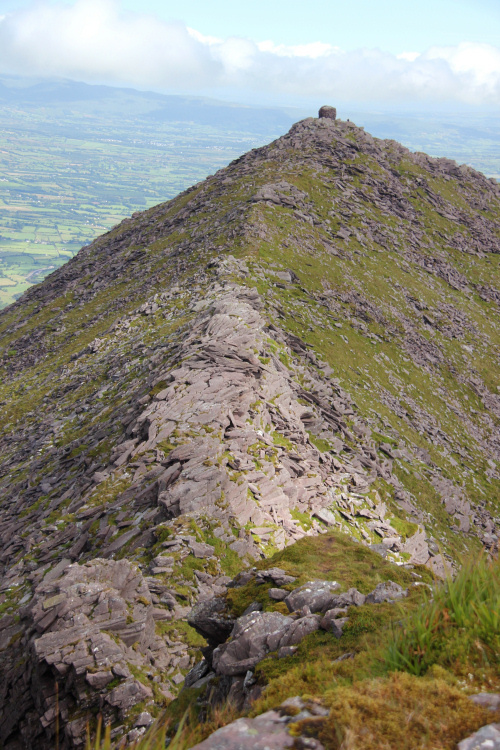 The initial section of the East Ridge was fairly straight-forward. I followed a path winding its way up and around various rocks. 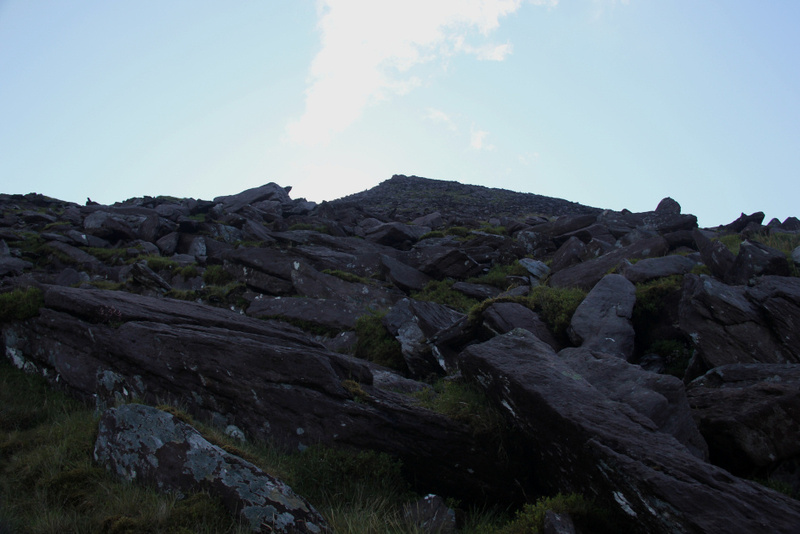 It wasn't long however before I lost all trace of a path and ended up clambering over countless boulders to make my way up the hill. I suspect I did not follow the best route. 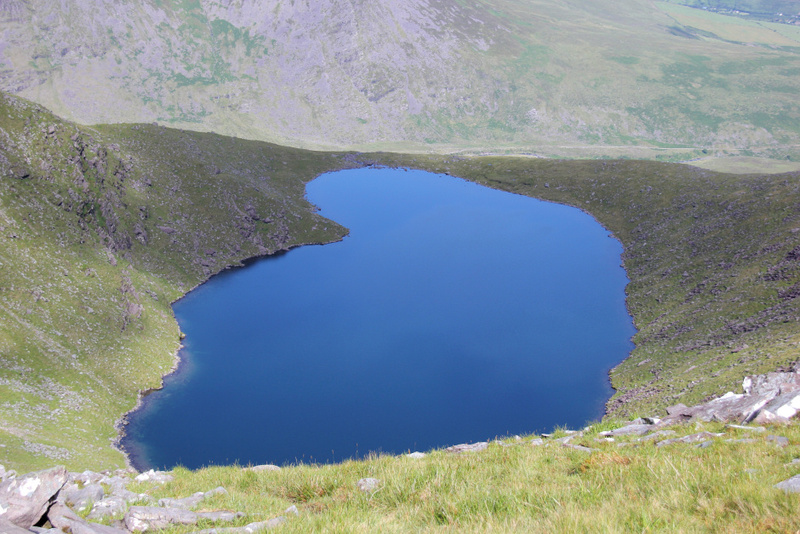 Just below the summit, I stopped to take a photo of the lovely view of three loughs (lakes/lochs). 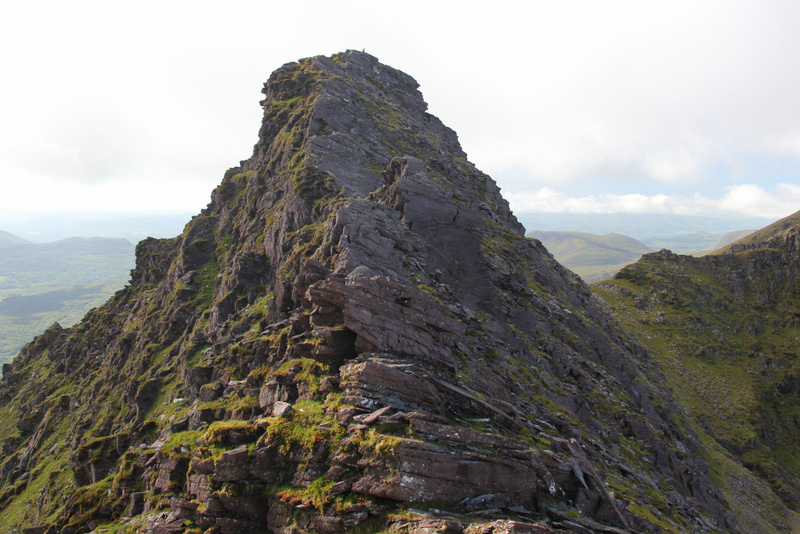 I eventually reached the summit of Cruach Mhor which has a large grotto at the summit. This was apparently built by one man over a two-year period. While having a wee break at the grotto, I met the first other walker of the day; a local who had previously undertaken the circuit many times. He seemed to be in a hurry and soon sped off towards Big Gun ascending at a somewhat frightening pace. No way would I be catching him up! 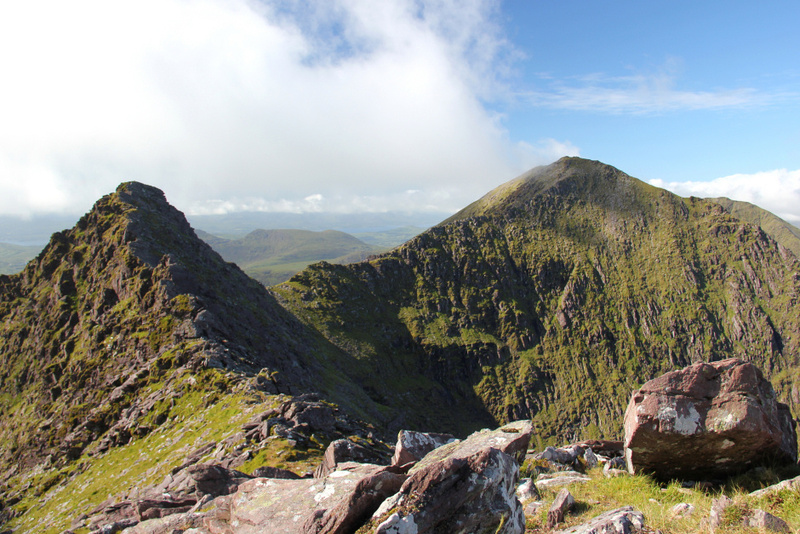 The section of ridge from Cruach Mhor to the summit of Big Gun is the most challenging part of the MacGillicuddy Reeks circuit. 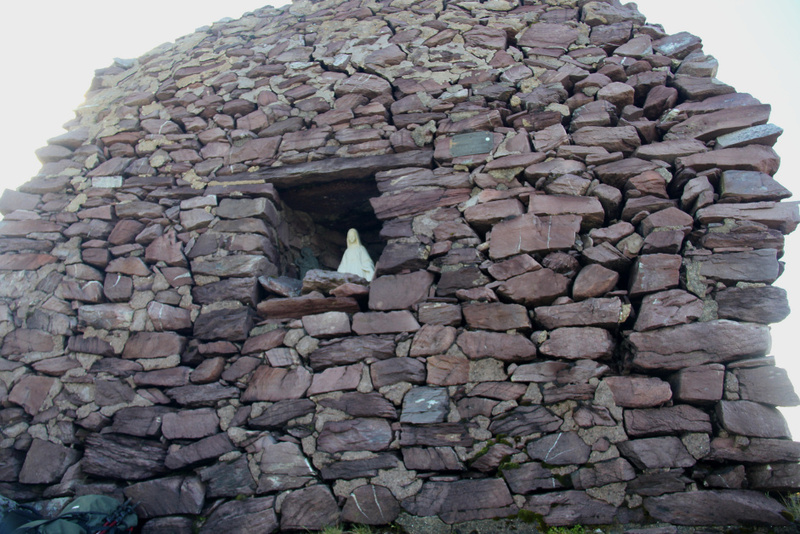 It was not always obvious which rocks and towers to go up and which to skirt round. As some of the bypasses looked a bit dodgy, I stuck to rock whenever possible. 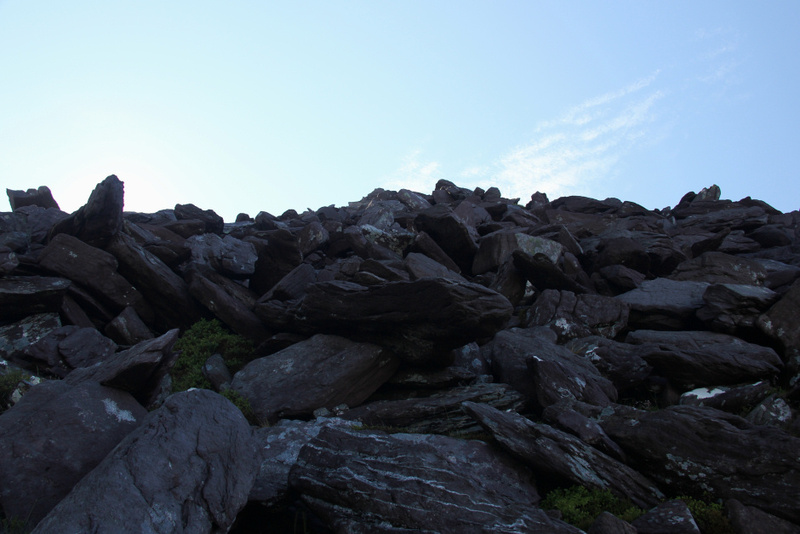 The next photo shows the scrambling required to get up Big Gun. 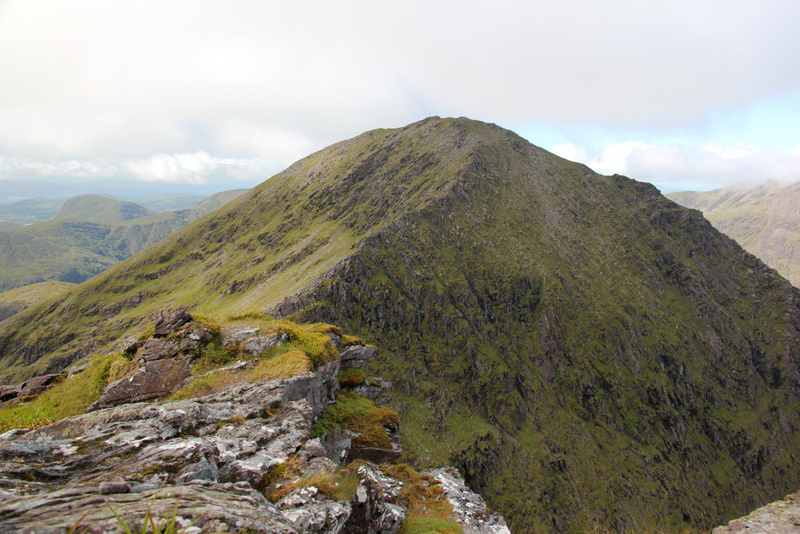 For a sense of scale, the man who passed me on Cruach Mhor is standing atop Big Gun in the next photo. 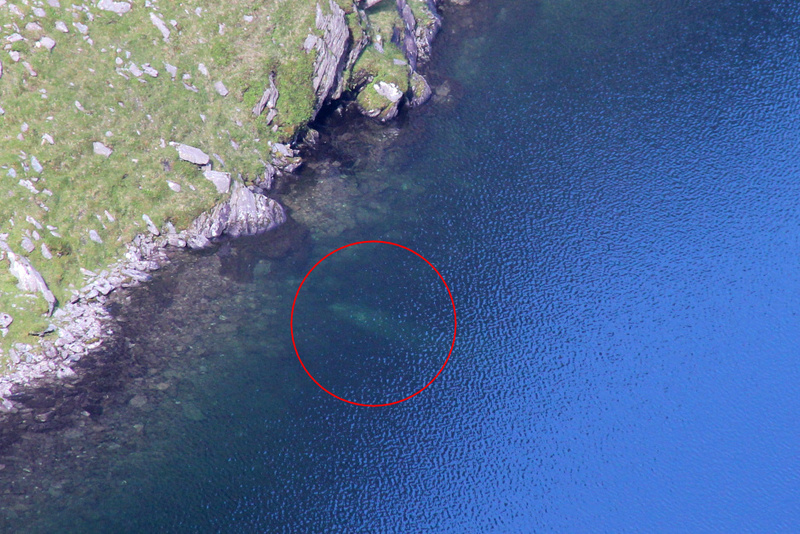 From the summit, I took a photo of the wing of a plane that was just visible in the lough below. The descent from Big Gun to the col was much easier than expected. 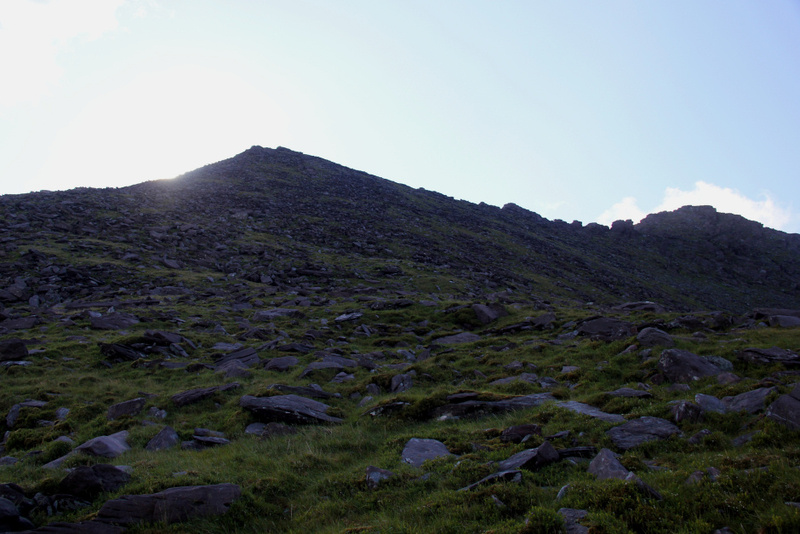 There was hardly any scrambling involved with a fairly obvious path to follow to the left of the ridge. Towards the base of the ridge there is a section where you have to lower yourself down a large rock. 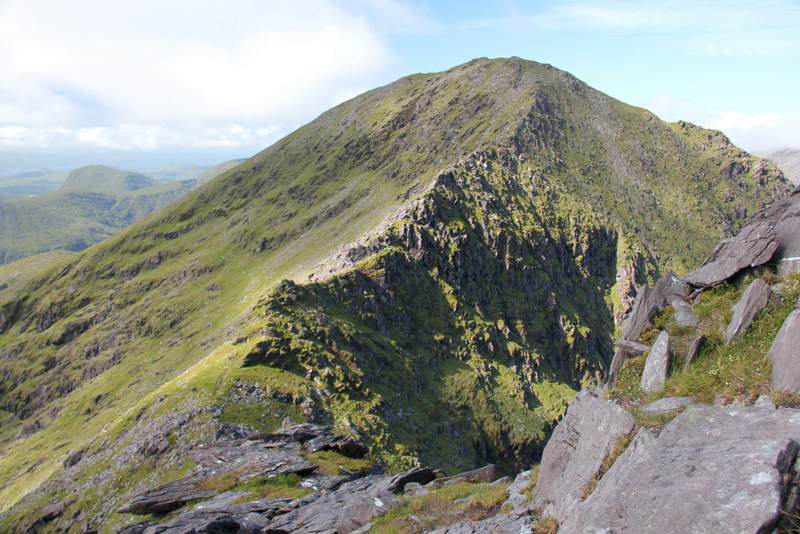 With Big Gun complete there was still more scrambling ahead to get to the summit of Cnoc na Peiste. 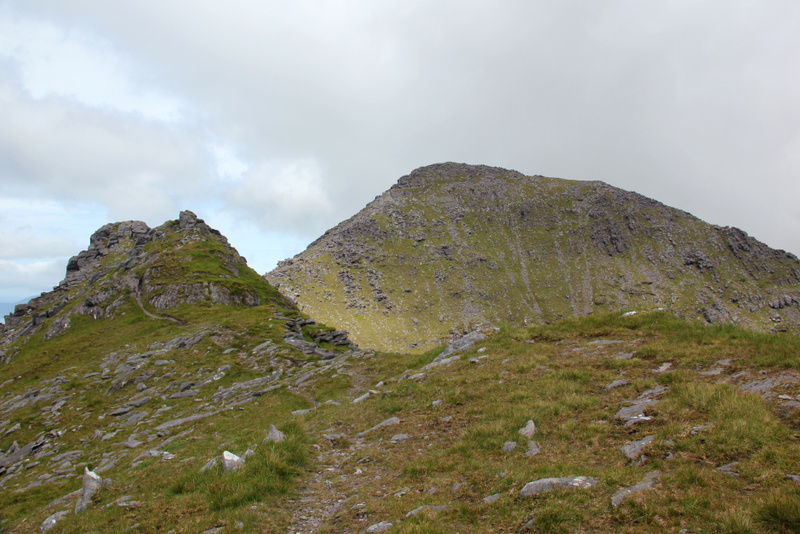 The ridge up to Cnoc na Pieste is fairly narrow in places but the path is fairly obvious. It was nice to look back to Big Gun to see the various towers and pinnacles that I had went over and around. 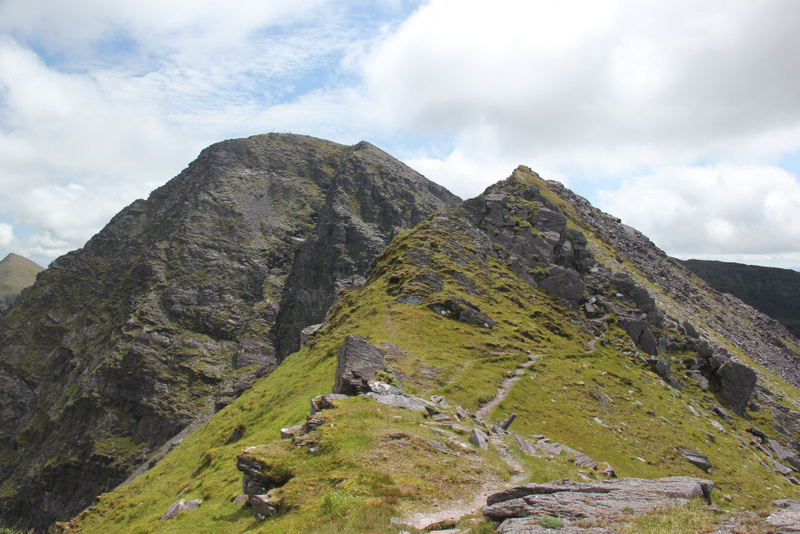 On reaching the summit of Cnoc na Peiste, I knew the walk from here to Carrauntoohil was just 'a walk' involving no hands-on. 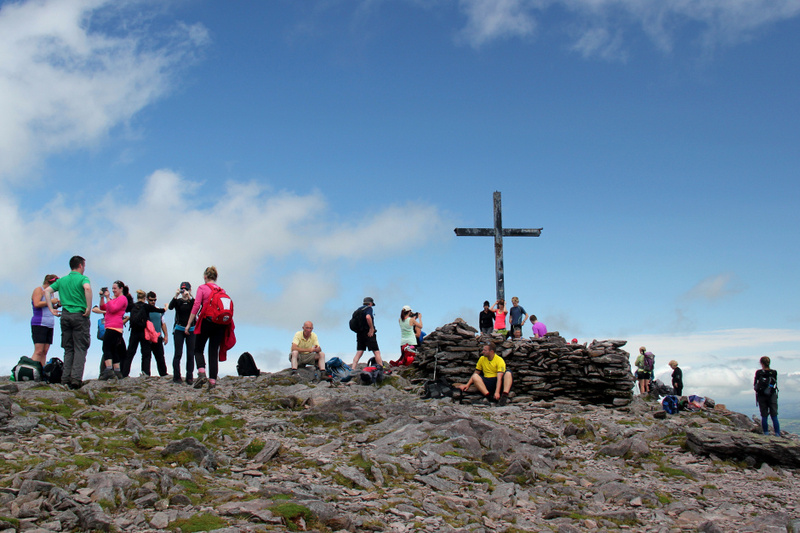 At the summit of Cnoc na Peiste, I met two other walkers. 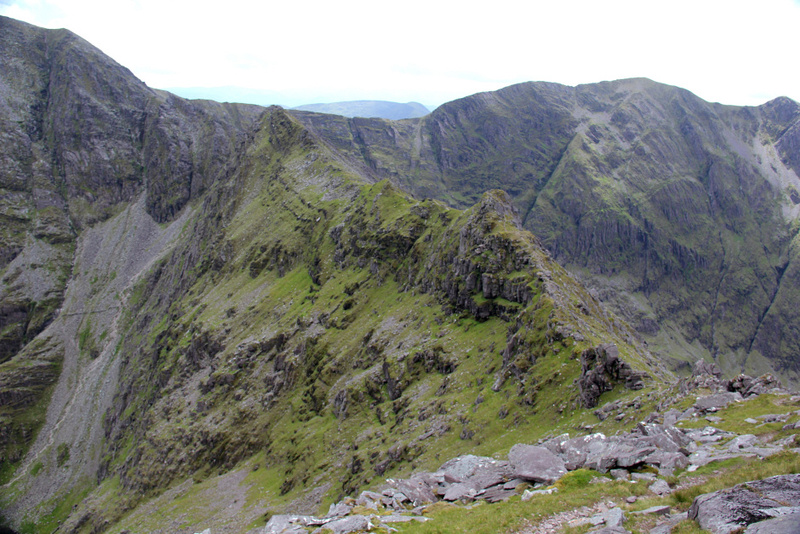 One had come up 'the Bones' ridge, the other had caught me up while undertaking the same circuit as myself. 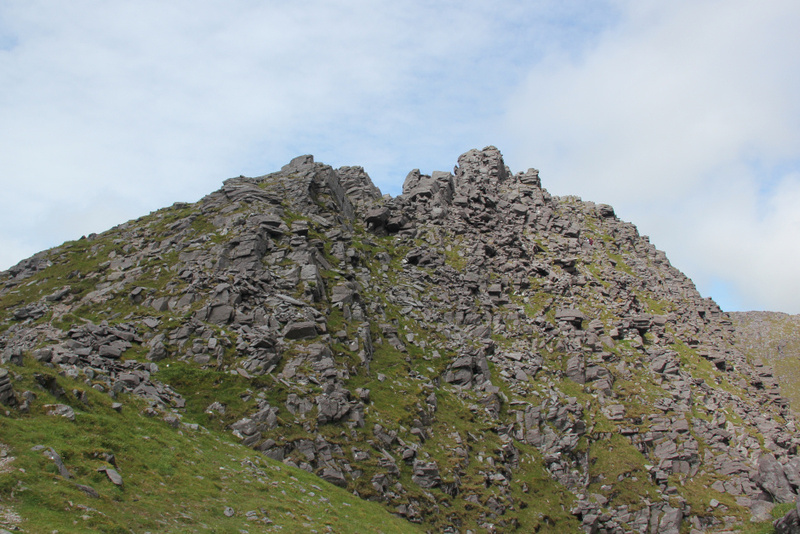 It was good to walk in company across to Maolan Bui and then to Cnoc an Chuillinn. 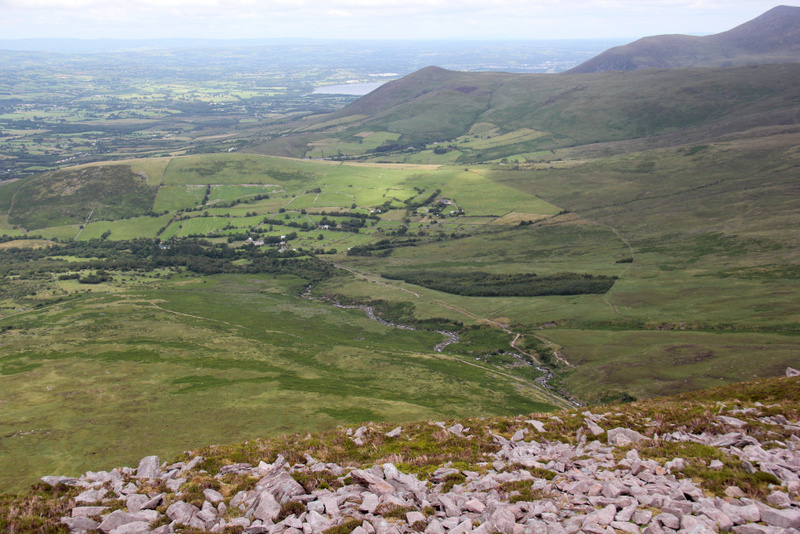 My temporary companion was from County Cork and these were his local hills. He pointed out lots of different ridges and features as we walked along. 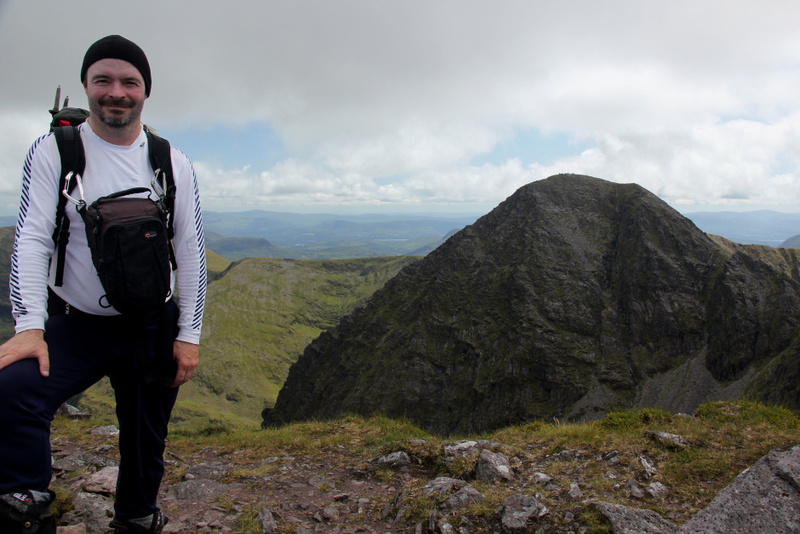 We also discussed walking in Scotland and his plans to visit to do the Aonach Eagach and Tower Ridge. 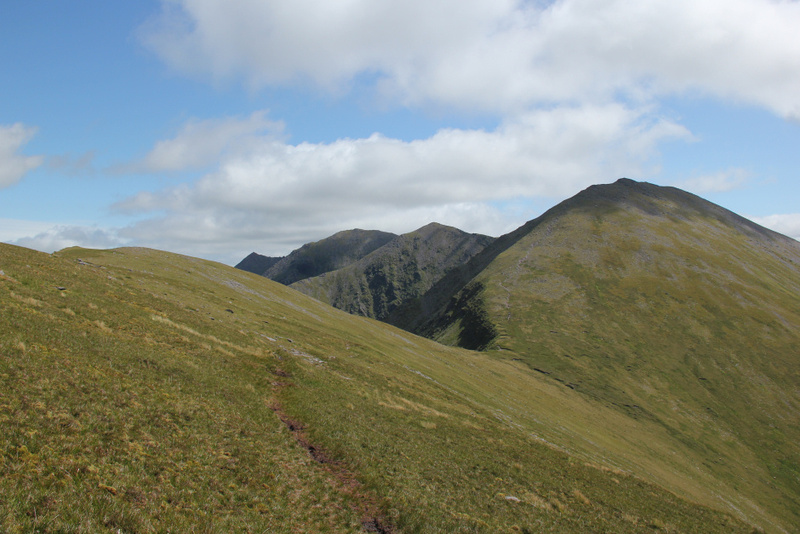 On reaching the summit of Cnoc an Chuillin, I began to meet lots of other walkers who had made there way up from the Hag's Glen. 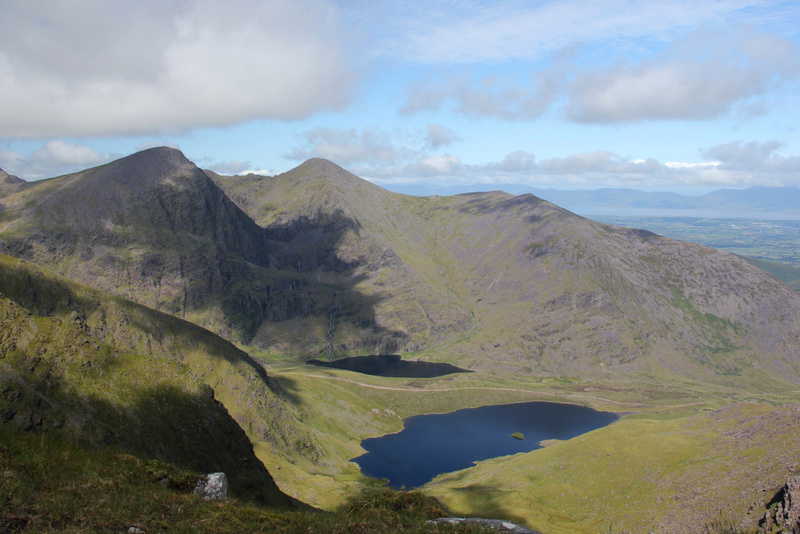 What I hadn't realised, from only checking out the 3000ft peaks, was the fact that a 845m peak lies between Cnoc an Chuillin and Carrauntoohil. 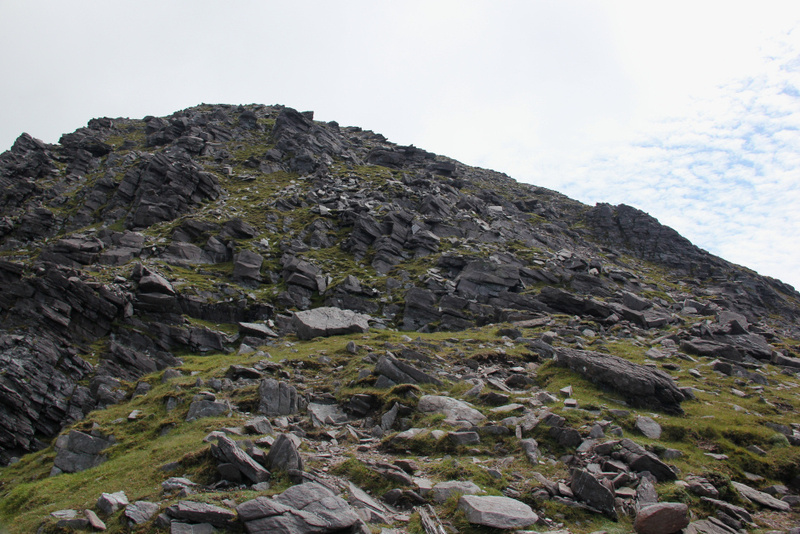 The walk to the summit of Cnoc na Toinne was very easy but the walk from Cnoc na Toinne down to the col before Carrauntoohil was very eroded with lots of wet peat. 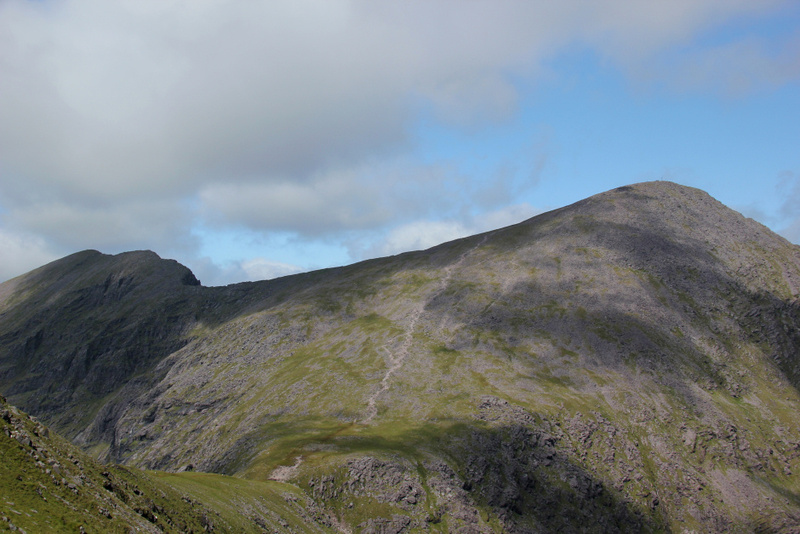 It was great to see the ridge that I had walked the day previous leading from Caher to Carrauntoohil. On Saturday, I saw nothing due to low cloud. 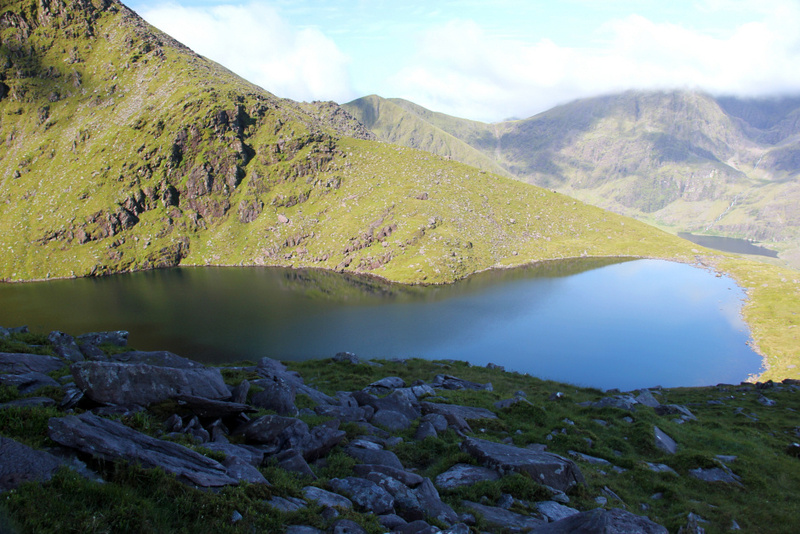 On reaching the col below Carrauntoohil, I had my one and only more than 30 seconds stop of the day where I had some lunch and finished off what was left of my water. If I hadn't already ran out of water, I would likely have again walked the ridge out and back to the Cahers. 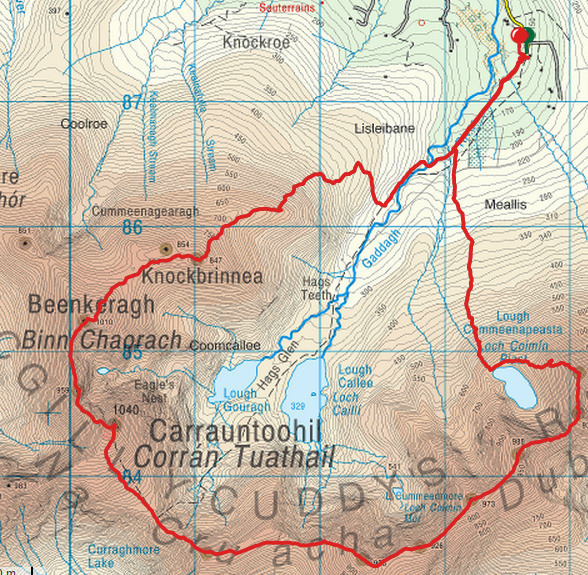 With Carauntoohil, the Beenkeragh ridge and Beenkeragh ahead not to mention the walk out, I felt that would be long enough without water. 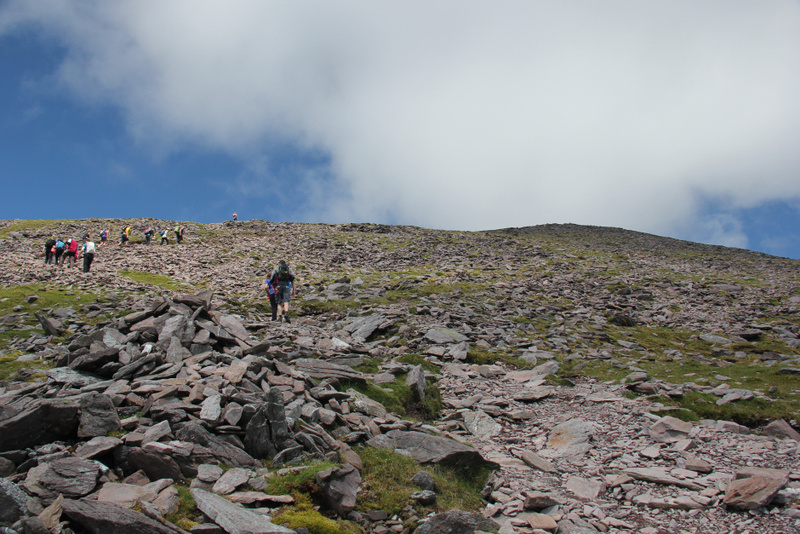 I followed the hordes ascending Carrauntoohil at a nice relaxed pace. I didn't hang around for long at the summit as it was far too busy; somewhat akin to Ben Nevis, Snowdon and Scafell Pike. 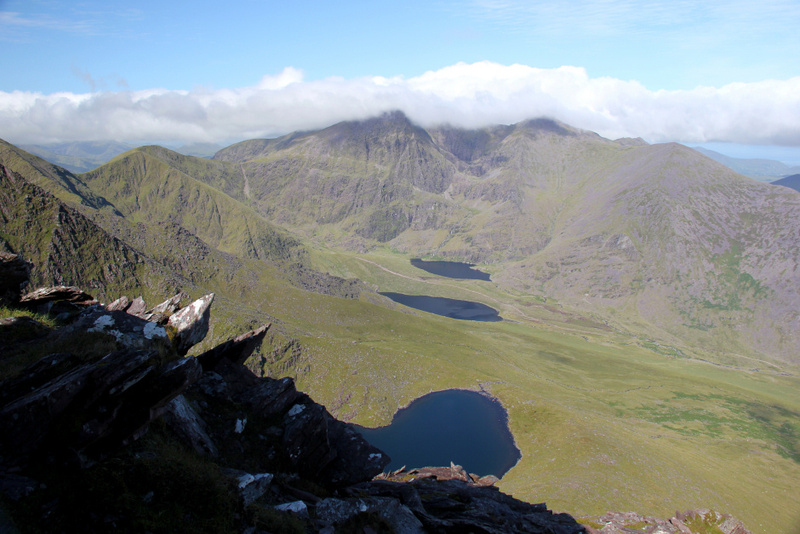 From Carrauntoohil, I made my way down to the start of the Beenkeragh ridge. 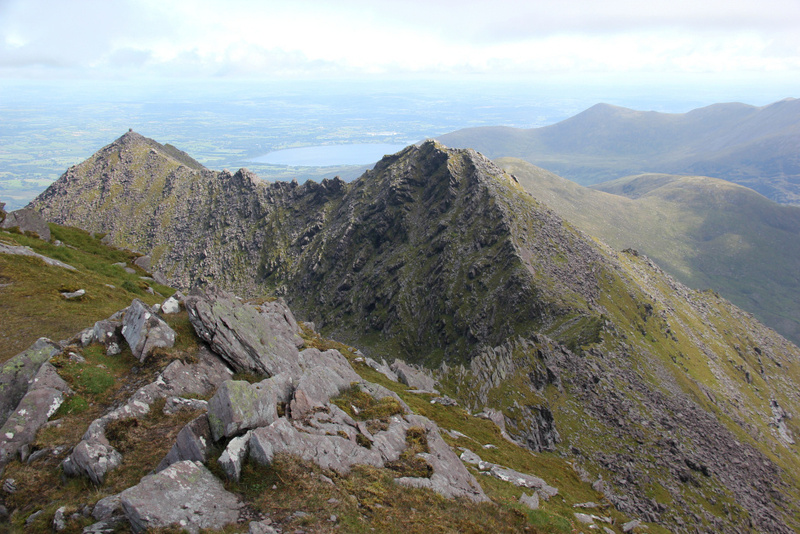 The descent from Carrauntoohil onto the Beenkeragh ridge is very steep and very eroded. Take great care if coming down this way. 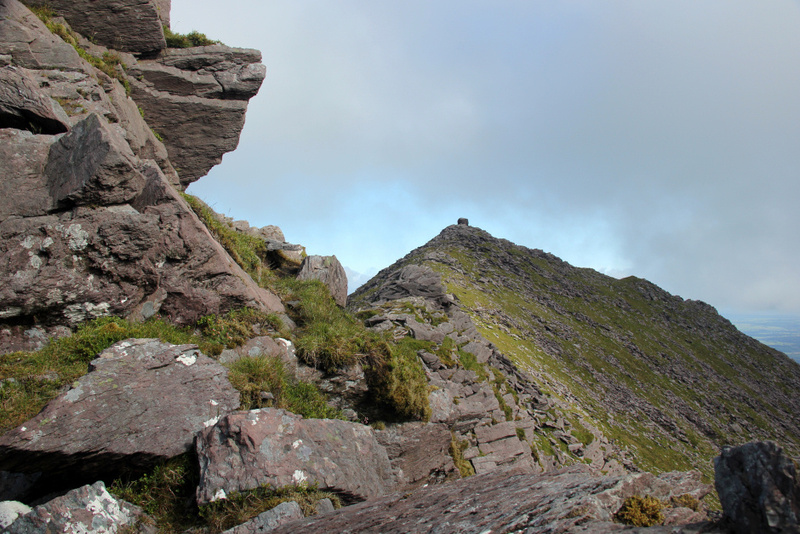 I had expected the scrambling on the Beenkeragh ridge to be fairly straight-forward compared with the scrambling on Big Gun. 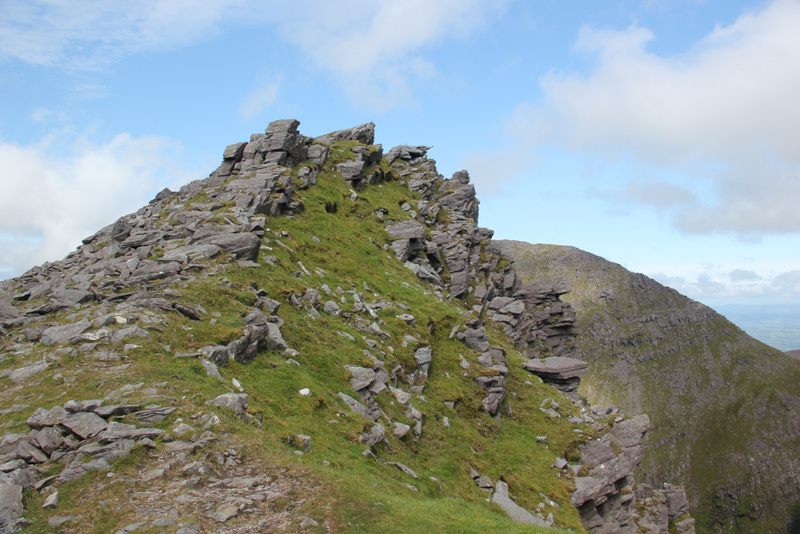 I found the Beenkeragh ridge every bit as tricky and more exposed than on Big Gun. I just took my time going over the top of some towers of rock and skirting round others, trying to follow any traces of a path. 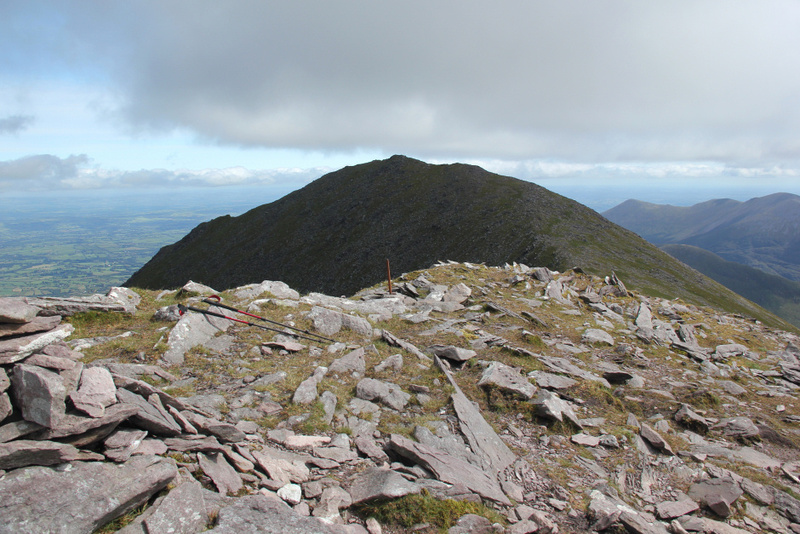 It was good to reach the summit of Na Cnamha, my final Furth. 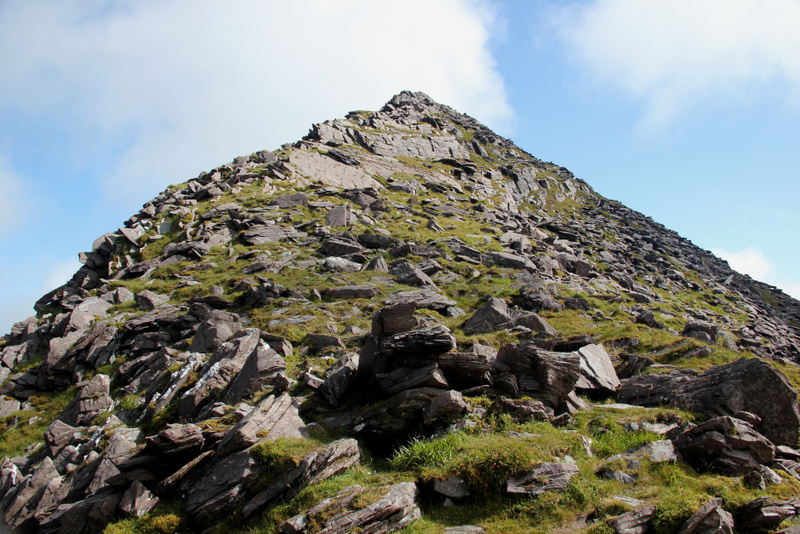 I ascended Beenkeragh on its own in 2014. 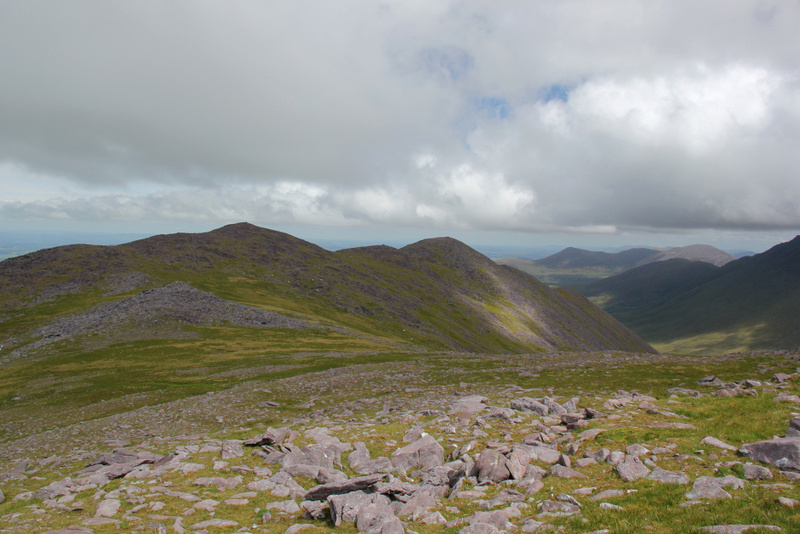 From Na Cnamha to the col below Beenkeragh it was mostly walking. 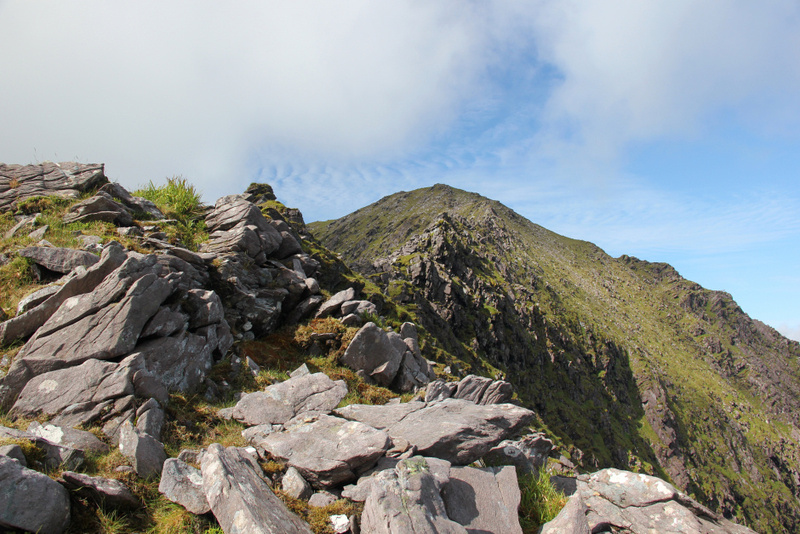 The hardest part of this ridge is definitely from Carrauntoohil to Na Cnamha. I enjoyed looking down to Coomloughra Lough and seeing the ascent route up Caher West Top that I had undertaken in cloud the day previous. 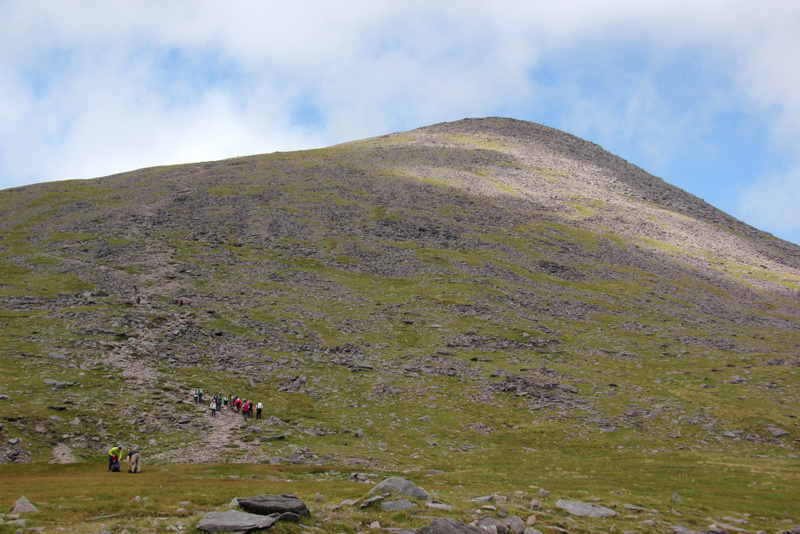 The ascent of Beenkeragh was much easier than it looked. 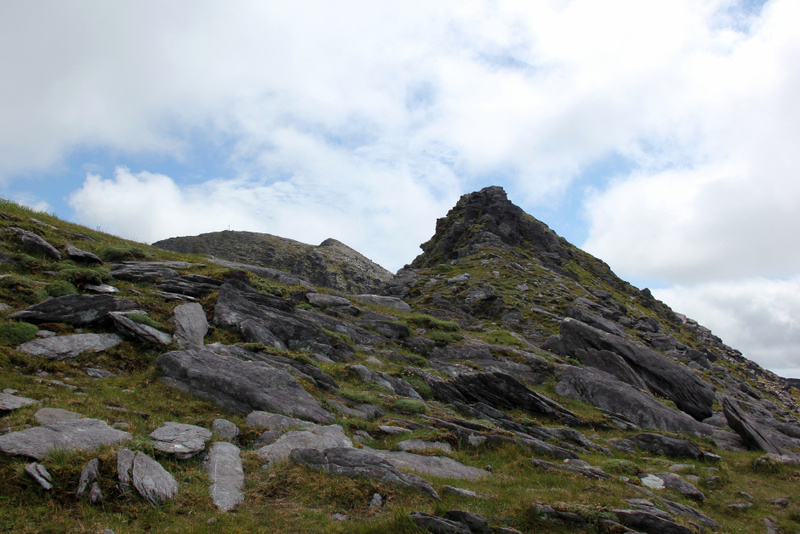 Many of the rocks and towers are skirted around by following a fairly obvious path. 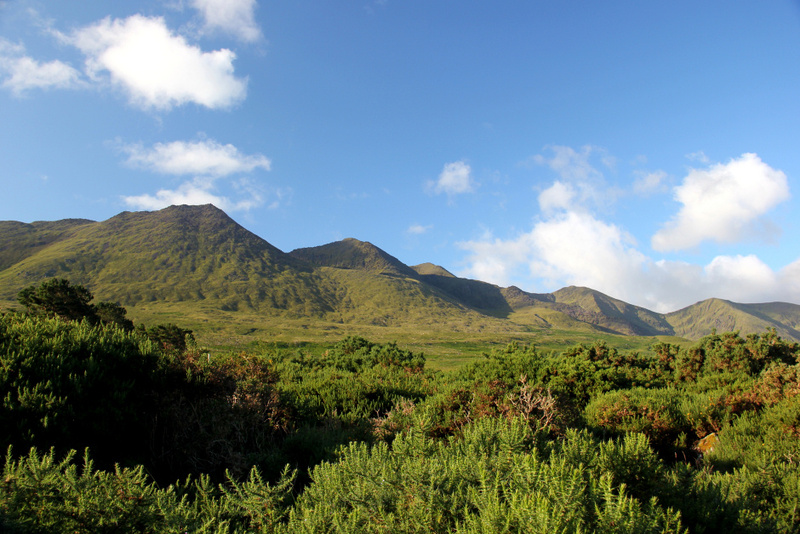 Carrauntoohil is a very impressive hill as seen from Beenkeragh. 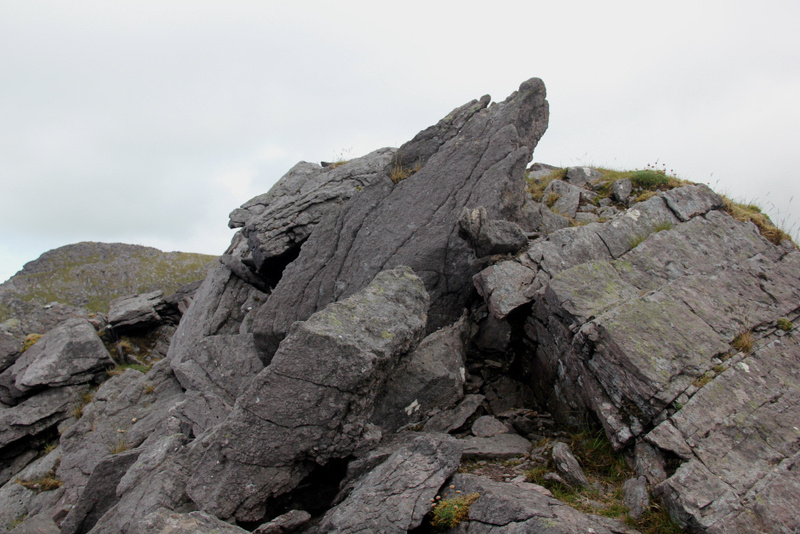 It has a very rocky, extremely vertical side to it. 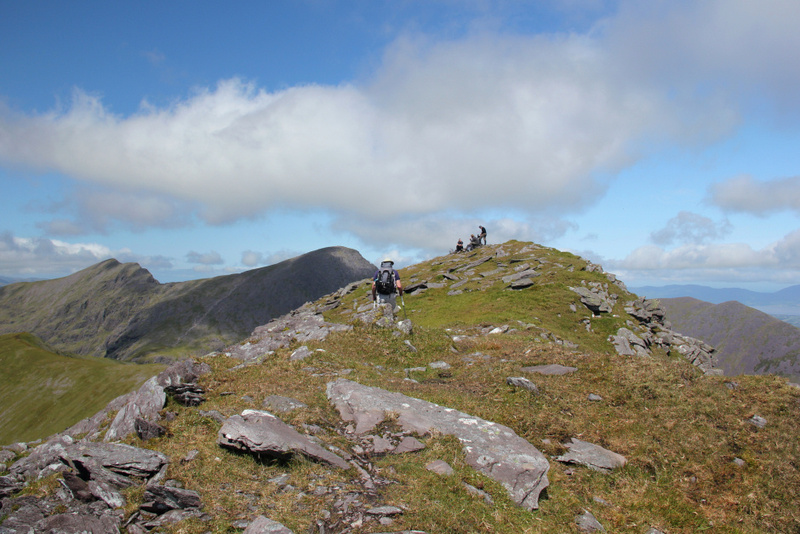 On reaching the summit of Beenkeragh, I met four other walkers who were standing at the summit. They asked if I would take their photo and then offered the same in return. I was fairly knackered and covered in sun cream but didn't like to say no! Having ascended Beenkeragh from Cronin's Yard previously, I was now on familiar territory. Despite being fairly tired and very dehydrated, I made my way back down to Cronin's Yard at a reasonable pace. 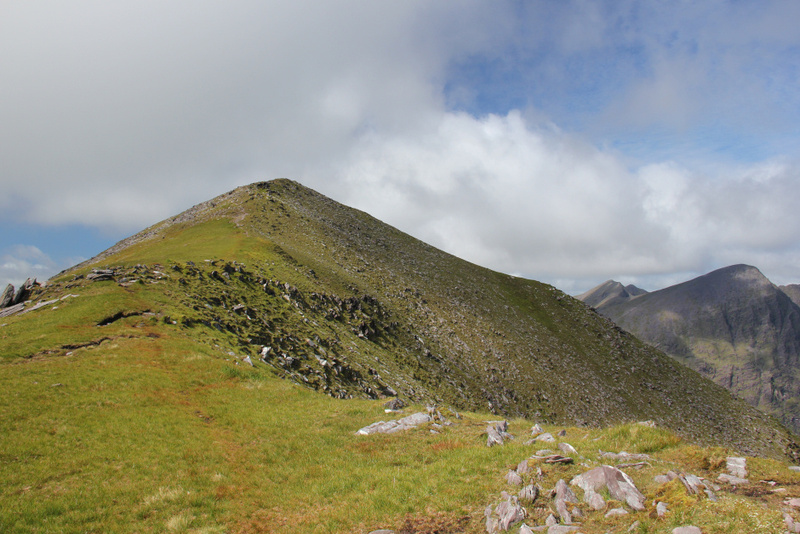 On reaching the Hag's Glen track, I again met the same walkers who were at the summit of Carrauntoohil. 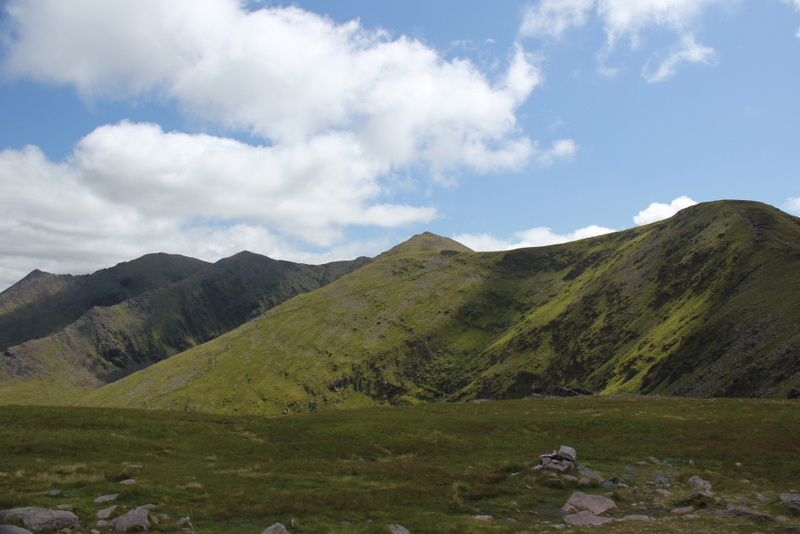 It had taken me the same time to traverse the Beenkeragh ridge, ascend Beenkeragh and descend back to Hag's Glen as it had taken others just to descend from Carrauntoohil. 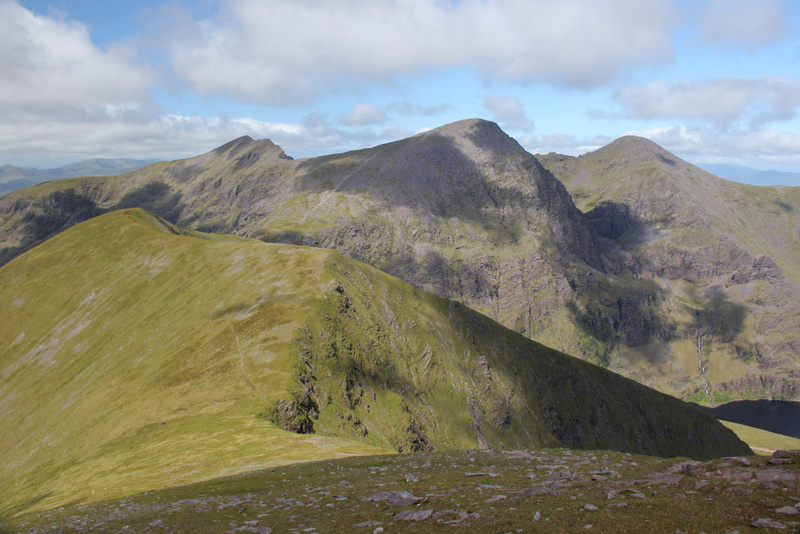 A circuit of the MacGillicuddy Reeks on a good day is up there with the best walks on offer in the UK. To my friend John, you should have booked this instead of doing Dull Donalds . 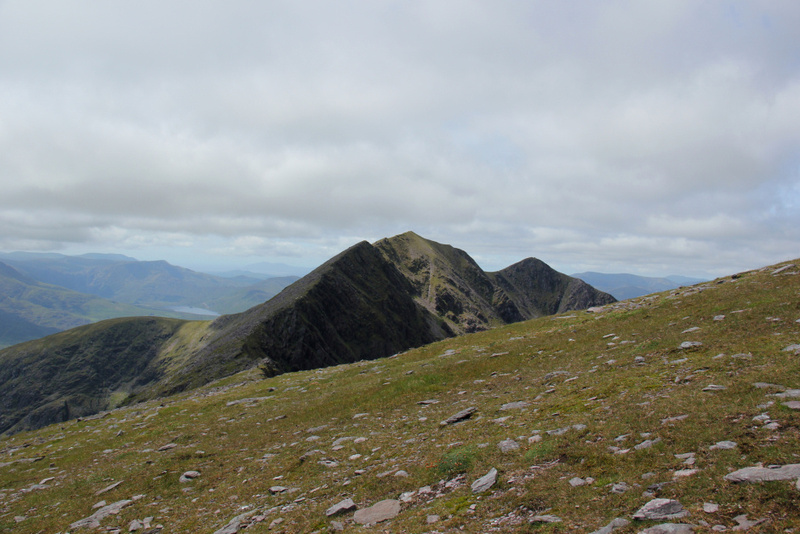 If you finish the Munros, doing the thirty-four Furths is well worth the effort.